The church belongs to the insular octagonal domed type and is a small reproduction of the catholicon (main church) of Nea Moni. It is a very well preserved Byzantine monument, richly decorated outside with brick patterns (denticulated bands, phialostomia, brick arches). The interior is covered with wall paintings made by Antonios Domestichos, Kenygos, from Crete, in 1665. 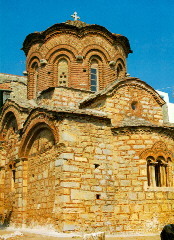 An inscription over the main entrance of the church informs us that monk Symeon, who later became the metropolitan bishop of Chios, erected the church "from its foundations" in 1564. This probably refers to a renovation of the monument, since its architectural and morphological features point to the conclusion that it was erected in the middle of the 14th century. Restoration of the wall paintings of the church began in 1985 and is still in progress. The monument is open to the public and it is used for religious purposes only once a year, on June 29, St. Peter and St. Paul's day.